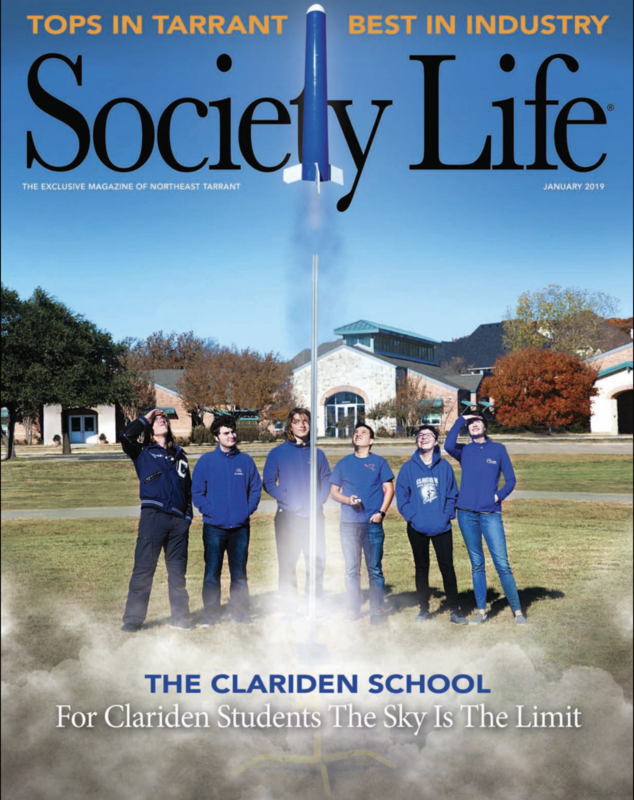 Medford Design-Build voted “Tops in Tarrant: Best in Industry” by Society Life Magazine! 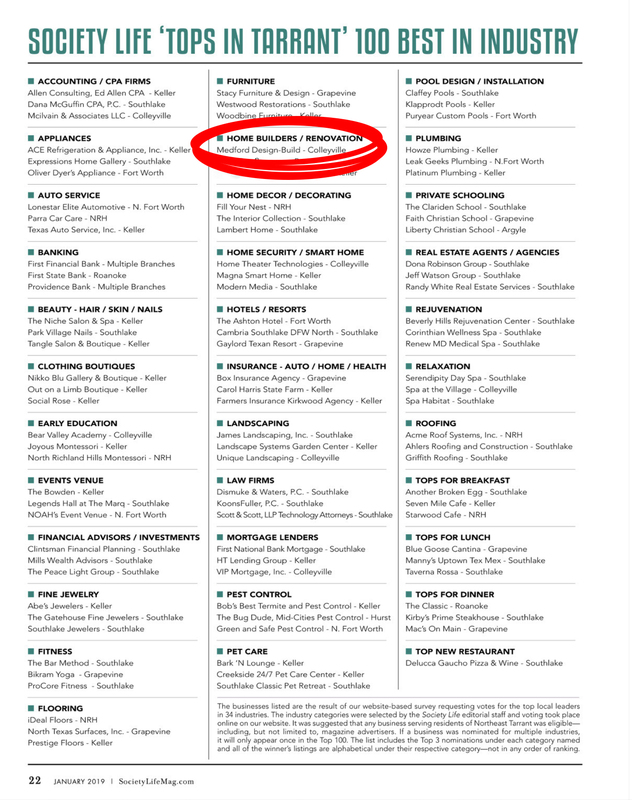 Medford Design-Build is thrilled to announce that we have been voted “Tops in Tarrant: Best in Industry” by the readers of Society Life Magazine! 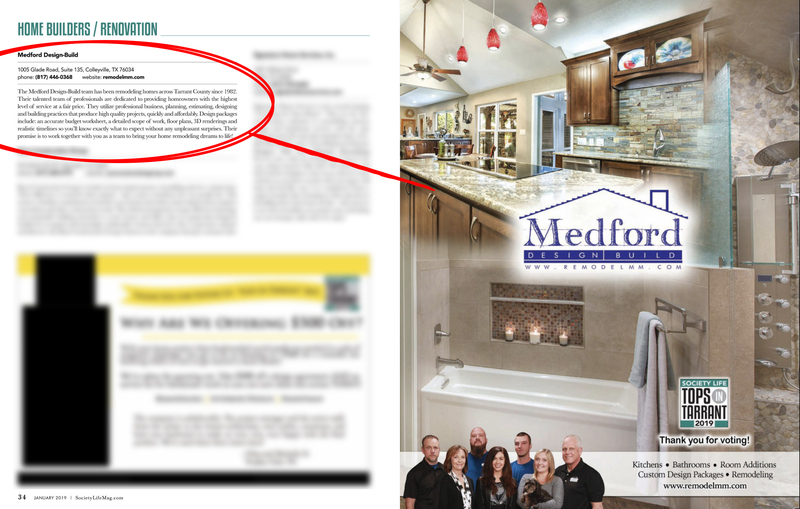 It is an honor to be recognized by the community of Northeast Tarrant County as one of the best local remodelers in the industry. We are so thankful for the recognition of our Colleyville office and hope to continue building great relationships with our clients in that area! Our team has been remodeling homes in Tarrant County since 1982. Over the years, we have extended from the Arlington-Fort Worth area to Northeast cities including HEB, Colleyville, and Southlake. After many months of consideration, our owner, Mike Medford Sr, made the decision it was time to open a second location in Colleyville in the fall of 2017. Since then, our volume of work in that area has grown exponentially! It has been a wonderful experience to offer our design and remodeling services further North while continuing to assist clients in central Arlington and Fort Worth. Our goal is to continue to grow, both our team and our list of happy, satisfied clients! Once a Formal Dining Room, Now a Custom Home Bar!